Imagine waking up to find your front lawn, like the scene above, covered with a welcoming party of dozens of pink flamingos. In some neighborhoods it's a tradition that's been kept alive through the decades. 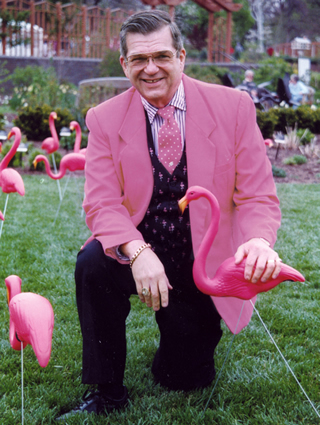 Don Featherstone, shown here in recent years, was the inventor of the original pink flamingo ornaments back in 1957. Price provides a treatise on how the concept of ‘pink flamingo’ has evolved in the mind and heart of Americans, from its original appeal to upwardly mobile working-class homeowners to its adoption by the camp generation, including Andy Warhol. In 1972 John Waters made the bird the centerpiece of his film Pink Flamingos, which made drag queen Divine a star, the city of Baltimore notorious, and ‘the filthiest people alive’ a title worth winning. Phil Toy appreciates their aspect as camp. But his love for flamingos goes deeper. The metal legs of the flamingos are a true mid-century modern touch, recalling the simple metal rods that many furniture designers of the period used to make their creations appear to be weightless. In fact, some design gurus argue, pink flamingos can be tastefully used for home décor. The ever-tasteful Dave LeBlanc, who writes the ‘Architourist’ column for The Globe and Mail in Toronto, acknowledged that modernists shun gewgaws in favor of purity. But where’s the personality in a bare lawn, he wondered? But none outclassed the flamingos, which were sold in pairs, male and female. 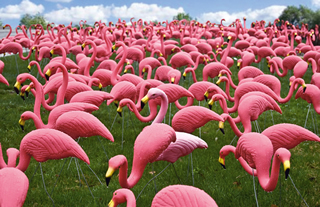 Starting in the 1980s, to set them off from a horde of imitators, Union-produced flamingos were marked with Featherstone’s name.